Okay. 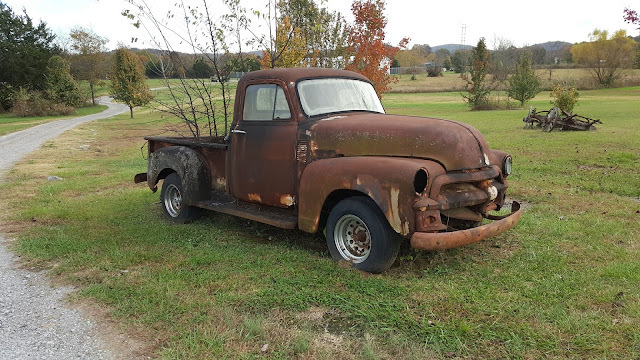 Don't be too,too surprised, but this installment of the blog will take us up to today. 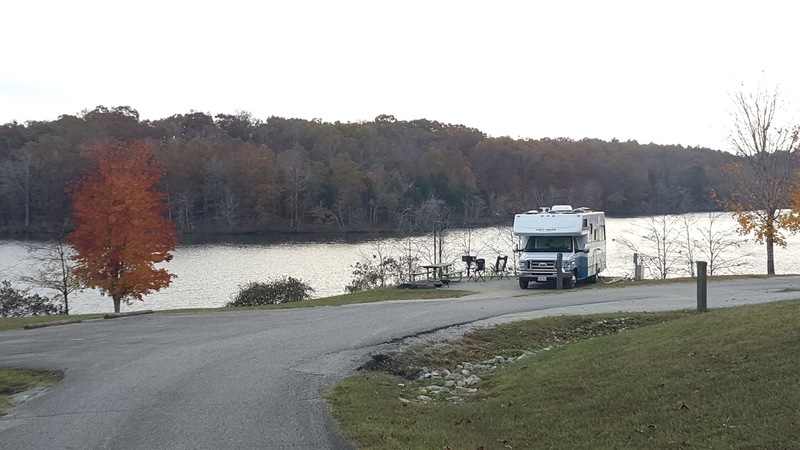 We left Claytor Lake in Virginia and headed south on Route 81. 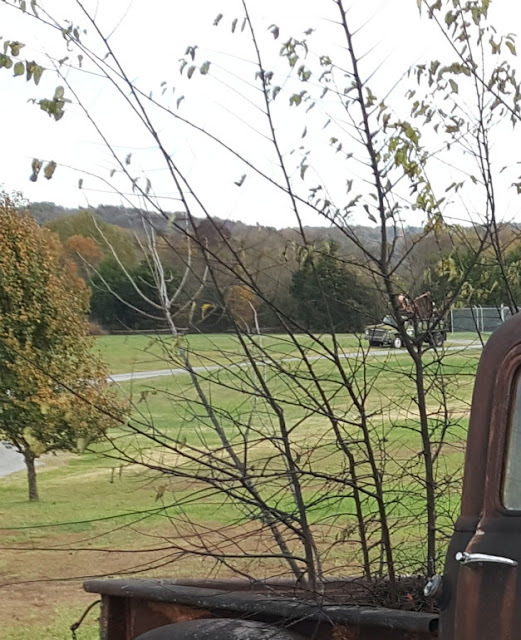 You might remember last time that we stopped at a comfortable park in Bristol Tennessee-just over the line--next to the Nascar racetrack. 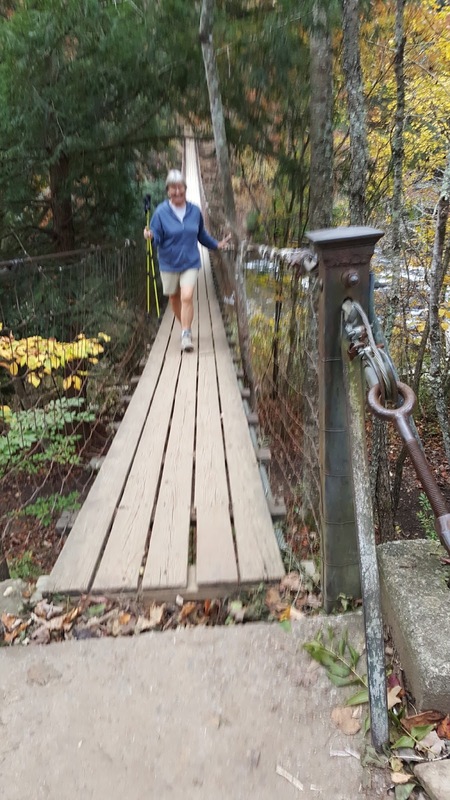 This time we headed for Warrior Path State Park named for the Great Cherokee War and Trading Path. Knowing it was Halloween weekend--from past experience--we actually made a reservation. 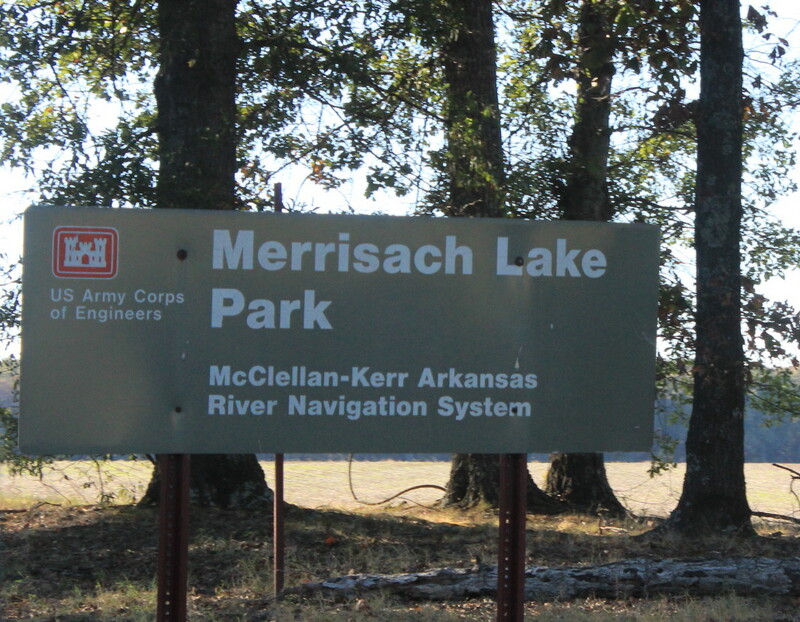 Not all parks offer this, but Warrior had a picture of each site online which helped us reserve a level good sized site. Good thing too, because come Friday night (Saturday was a rain forecast) the park was filled with camping Halloweeners and seemingly visiting Trick or Treaters from the local area(way too many for just campers). The park set it up quite well with large signs to put on your site marker if you were a "candy stop". We enjoyed seeing some of the costumes and decorations. The next stop was further south on Route 81 to Route 160 towards Morristown and Panther Creek State Park. We really enjoyed this park. The spacing between sites was great. 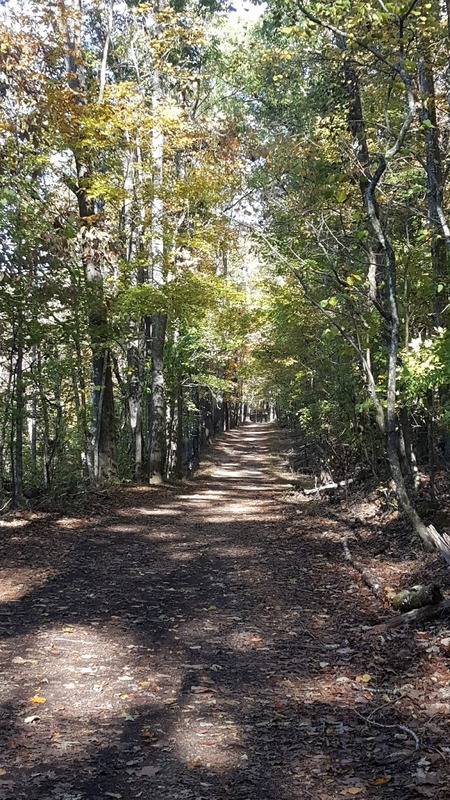 And there were a number of choices for hiking trails such as the above picture of the Old Wagon Road Trail that we hiked. The park has 17 hiking trails for more than 30 miles and 15 miles of mountain biking trails.Don't forget fishing for bass, crappie, bluegill,catfish, rockfish, and bream. 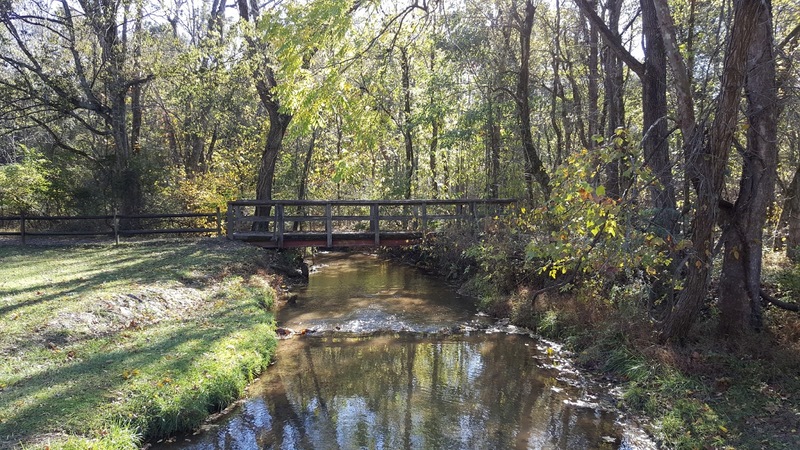 The Wagon Trail follows the stream. 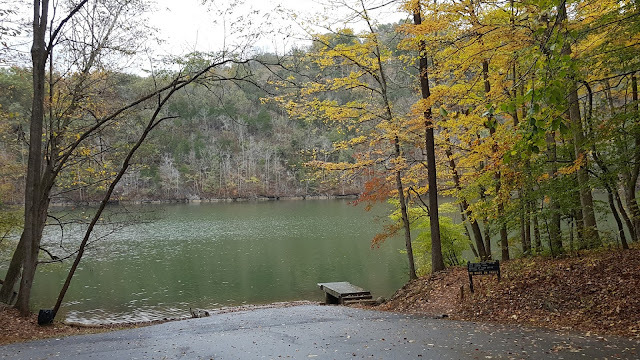 This lake was created by a dam built by the TVA Tennessee Valley Authority on the Holston River in 1940. The huge lake covers 59 miles in length, and 463 miles of shoreline. It also provides hydroelectric and flood control. 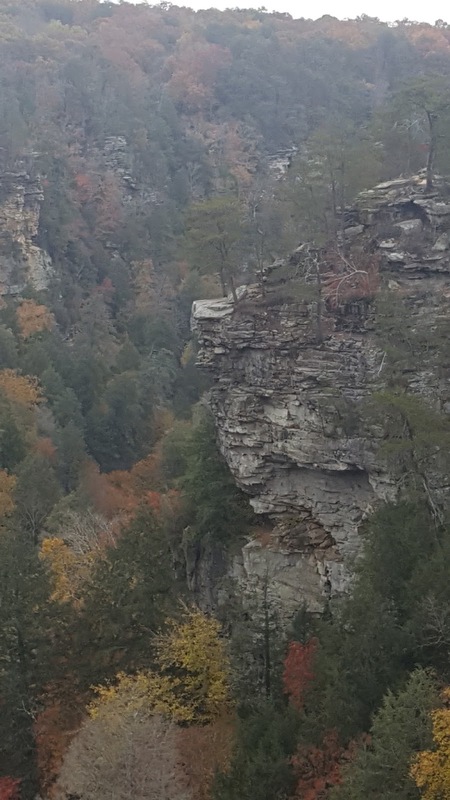 This view is seen along a short scenic loop out of the park. 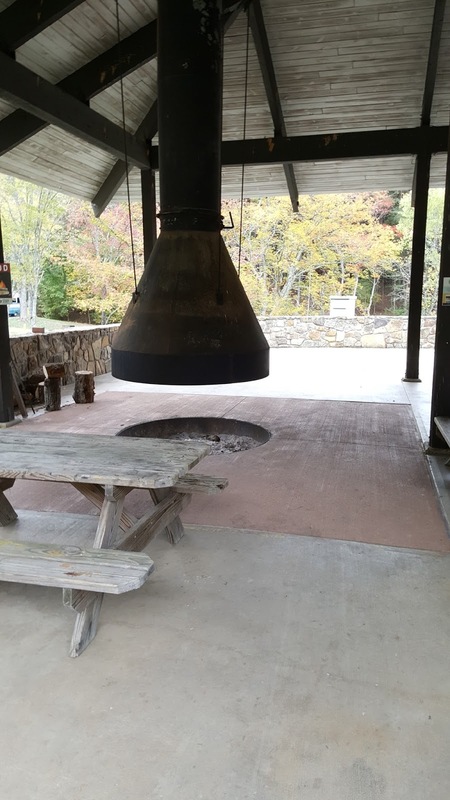 This unique fireplace is located inside a large group shelter within the campground. 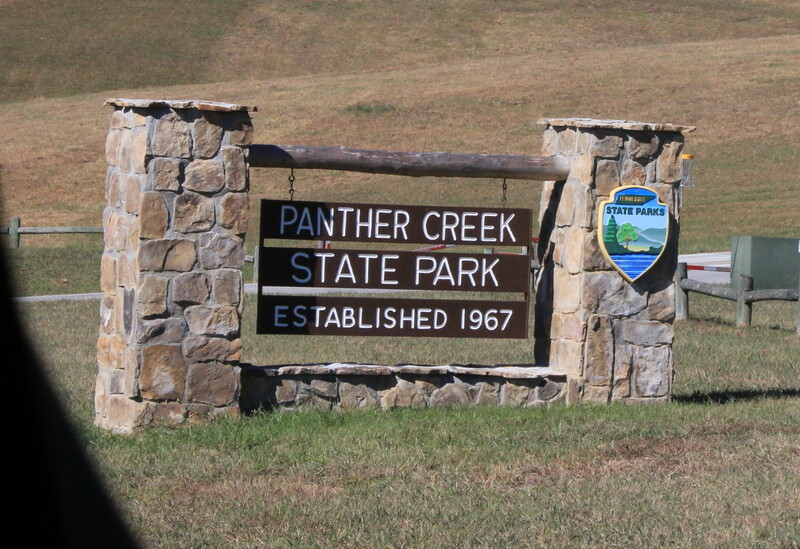 From Panther Creek we head down Route 11 and onto Route 40(Interstate 81 becomes Interstate 40 around Dandridge) . Traveling past Knoxville we head south on Route 101 in Crossville to Fall Creek Falls State Park in Spencer, Tennessee. 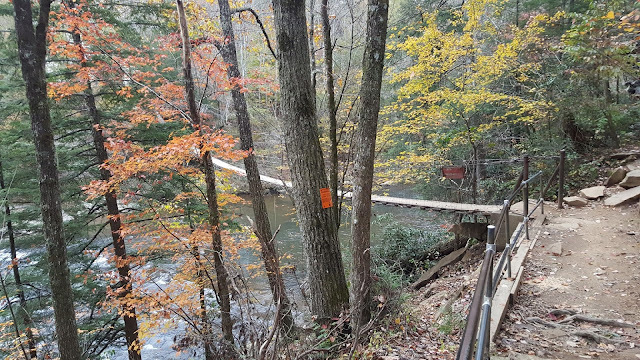 This park was voted the best state park in Southeastern United States by Southern Living readers. Even with a cloudy day, the colors in this camping loop were wonderful. The park covers 26,000 acres across the rugged Cumberland Plateau.More than 56 miles of trails are offered from easy to difficult. We tried the Campground trail to the Woodland trail which allowed us to see most of the falls and the Nature Center. 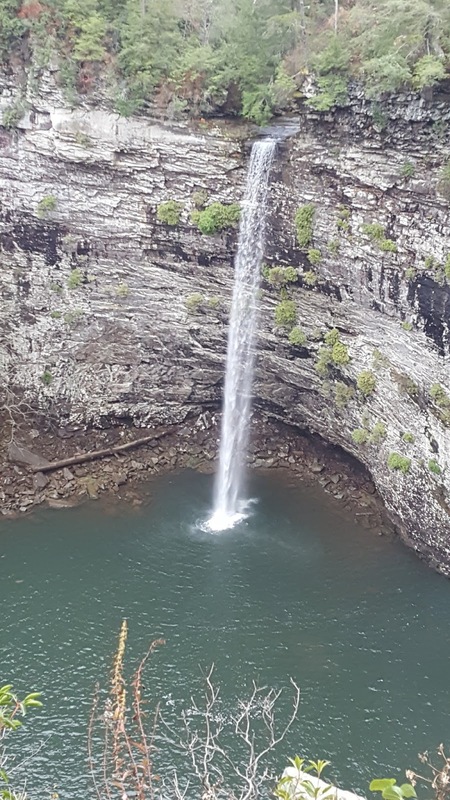 This is Fall Creek Falls from above. 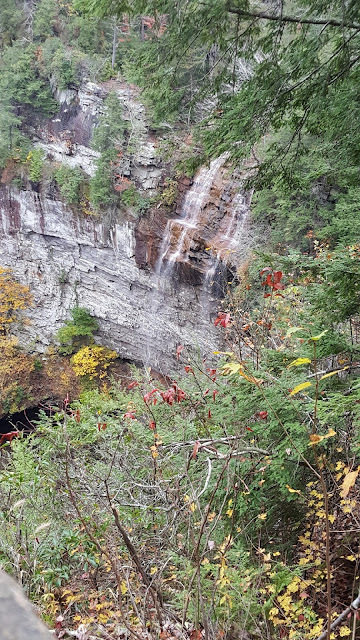 One of the highest waterfalls in the Eastern United States at 256 feet. 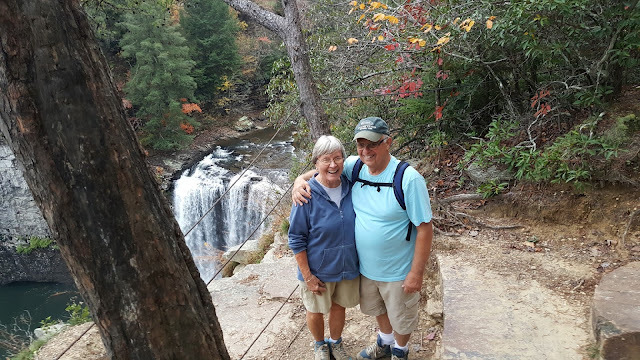 We took a picture of a young couple at the Cane Creek Falls and they returned the favor. We are smiling because they were impressed that we were hiking this distance with some steeper sections. We smiled!! Go down that steep trail to the overlooks because sometimes those views are superb. Our new hiking poles came in quite handy. We wish all trails could be as rewarding. An unexpected surprise. A swinging suspension bridge. I think Jan would agree. An adventure all by itself. 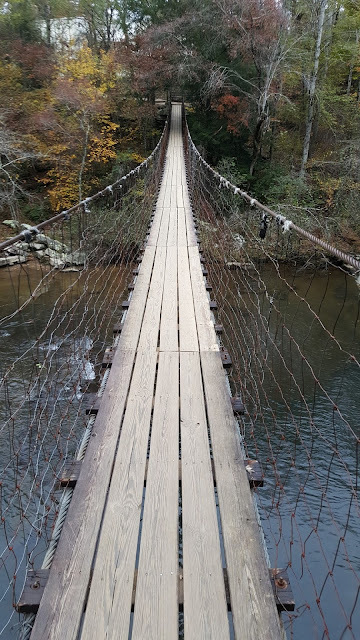 By the way, you have to return over the same bridge. We enjoyed our site--all sites well separated. Even picked up some heat treated firewood to enjoy. By the way, most state parks and some others are now supplying heat treated firewood to keep the infestations down. Most mentioned is the ash beetle. There is this wonderful scenic drive in the park. 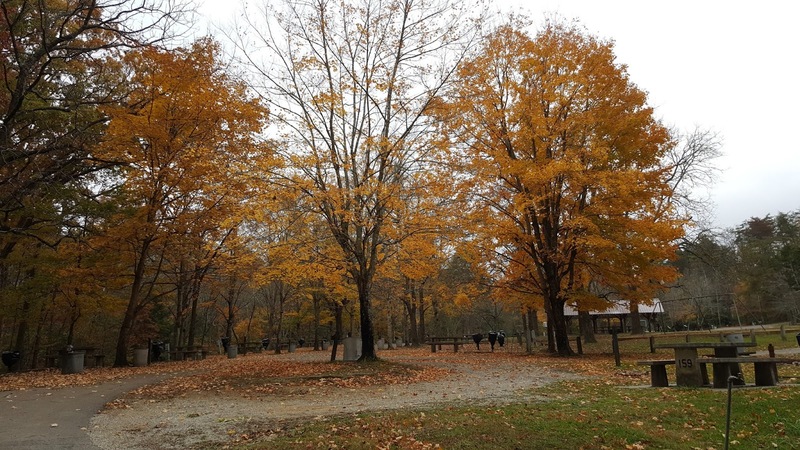 The park also has a campstore, clothing store(called outfitters), swimming pool, snack bar, laundromat, Arbortrek Treetop Obstacle Course, 18 hole golf course, tennis courts, lodge and restaurant. We could easily have added more nights here. This part is a single lane road through colorful woods. As nice as some of the New England colors we had seen. 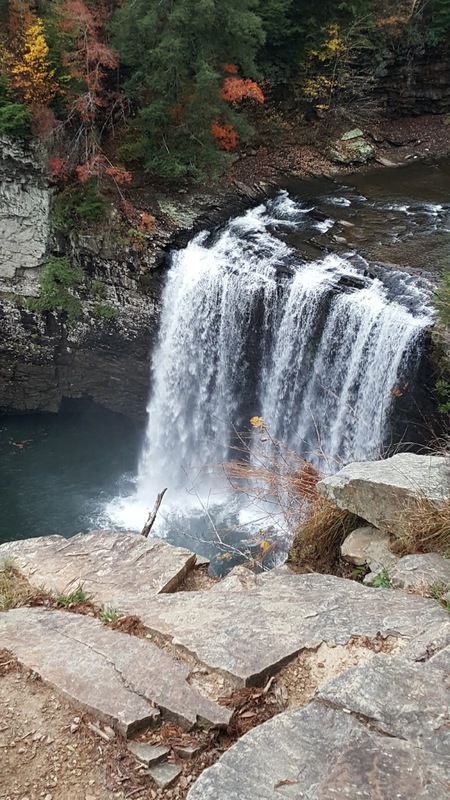 This is the website for Fall Creek Falls. A little closer to show you that those trees are growing right up through the bed(what used to be the bed) of the truck. The inside of the cab is not much better. From Fall Creek Falls we continued to the south entrance to Route 111 north to U.S. 70 west. That took us to Route 231 to the private campground and then Route 40 . Instead of following Route 40 through Nashville, we took Route 840 around. A little west we head off to Natchez Trace State Park. We had been here before and we still find this a very relaxing, enjoyable park. When you come at the right time, you have a good chance of a watersite like ours above. In the park was this old refurbished trailer. While we could not say exactly the year or model for this one, these two websites may help a bit. 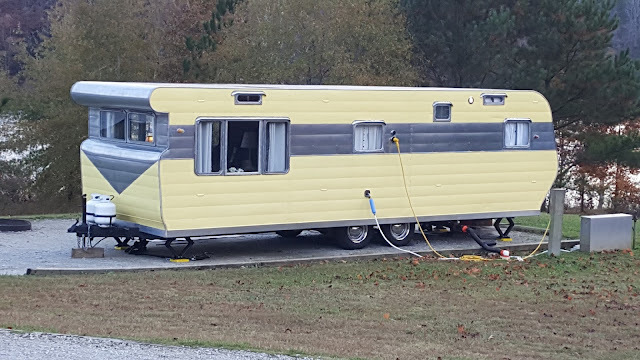 If you scroll through the second one, you will find a link to the famous"Long,Long Trailer" clip with Lucy and Rick and their 1953 Mercury plus trailer. Note --no vents or AC units on the roof, no storage bins underneath, no sign of hot water vent, refrigerator vent, etc. We will bet that the interior is wood and quite beautiful. A warm afternoon. Perfect for outside gawking and reading. 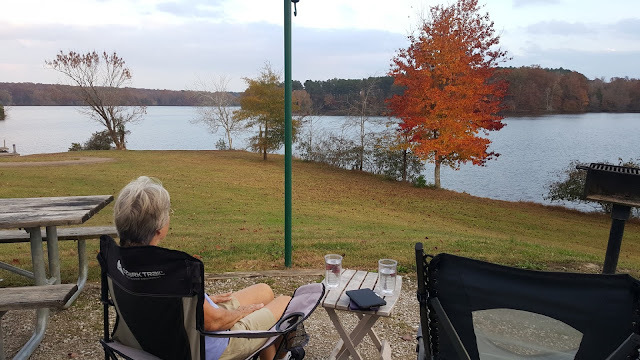 From Natchez Trace we continue south and west to Lexington and then north on Route 20 and 412 to Route 40 and west to West Memphis, Arkansas. 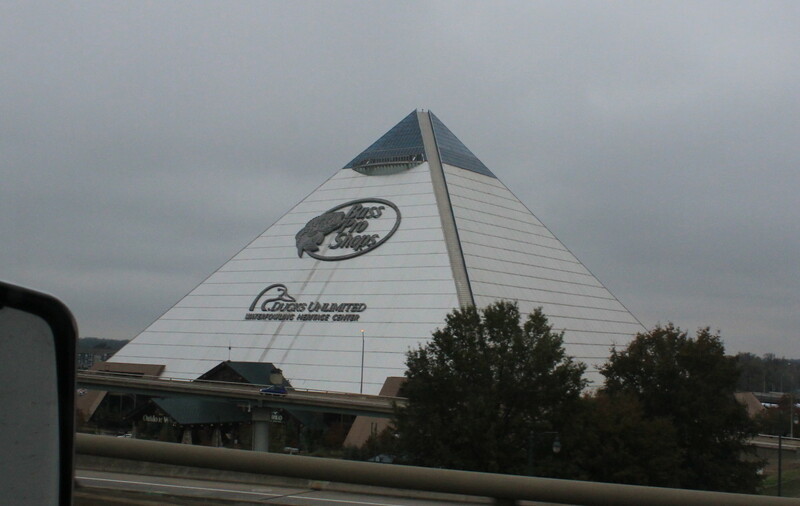 Right before crossing the Mississippi River is this iconic Bass Pro Shop . Also a big thank you to the staff at St. Jude Hospital , very visible from Route 40. Have to certainly appreciate the work they do. 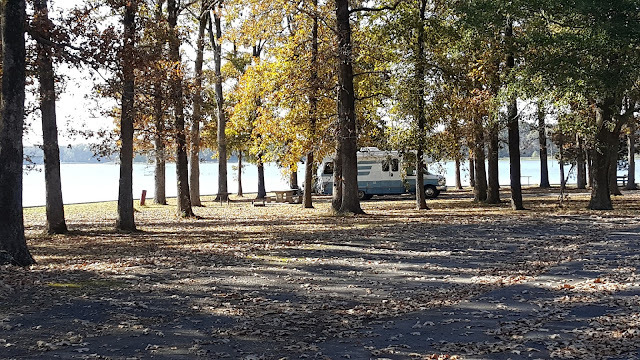 Back to another one of our favorite stops--Tom Sawyer's RV Park on the west shore of the Mississippi River in Arkansas. From Lady Blue we can sit and watch the barges go north and south. At the inland side of the park is the laundromat. Way up high. Why? 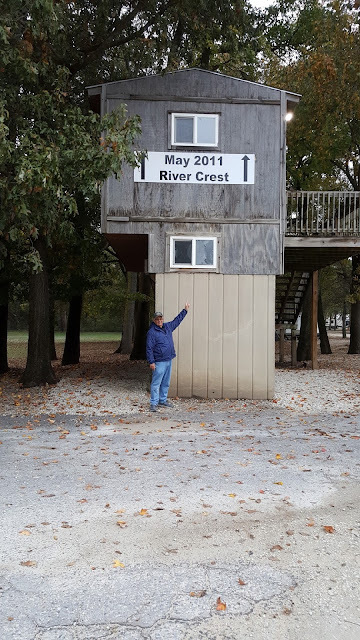 Note how high the river got in 2011. This park is geared for floods. There is plenty of notice when the great river is going to flood, so they calmly remove all important infrastructure , ask all campers to leave, and button up until the river recedes. 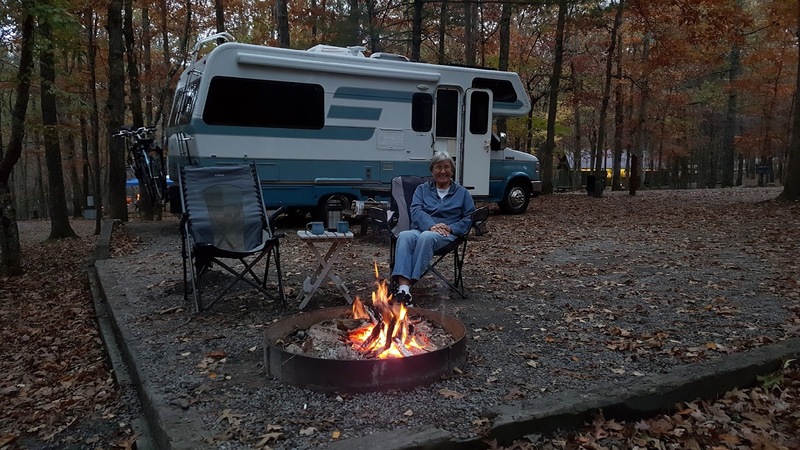 Jan and I then head back to Route 40 west for a short ways and take Route 79 south to Route 1, Route 49, and then Tichnor for Merrisach Lake Corps of Engineer Park. The route takes us through mile after mile of cotton fields and other agriculture. The park is on a lake that is also part of the Arkansas River travelway with locks for barges to travel towards the Mississippi or north towards Little Rock. We found a great walk-in site on the shoreline and were soon surrounded by many hunters in the other sites. A note though, to be clear, all those hunters were here when this picture was taken. Good separation between sites. Modern Weapon Deer Hunting Season started on Saturday, November 11th. By noontime, we noted three sites had caught their deer--two doe and one good sized buck. From Lady Blue--a great view of an Arkansas sunset. Another favorite COE park to add to the list, even though a bit off the beaten path.